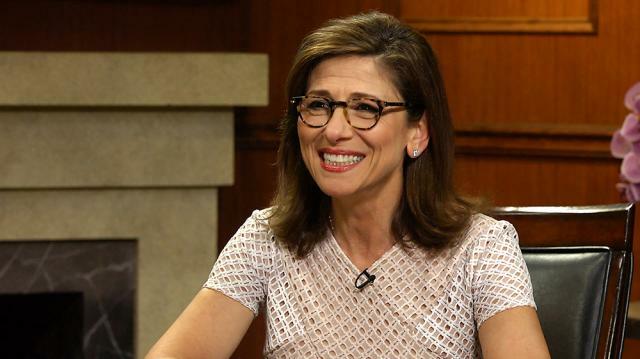 Former Chairman of CBS Entertainment Nina Tassler discusses her path to the top of the TV industry as a woman and the lessons she's learned along the way. Nina also talks 'The Good Wife' – a show she greenlit at CBS – and her pick for TV's next big hit. “I made a connection. I knew at that moment our relationship was changing, so I immediately said, ‘Well I need to get a book. I need to find out what I am i supposed to say to her from this point on.’ And I went and I looked in bookstores and I couldn’t find one and I thought okay if there’s not a book there, maybe I should write one. I set about contacting women from all over the world, all different disciplines, all walks of life…all had daughters. That was the one criteria. You had to be the mother of a daughter and it could be a step-daughter, it could be an adopted daughter, and I wanted women from all diverse backgrounds.” — Nina Tassler on the moment she decided to write the book. “My mother was very active in the civil rights movement. My mother marched on many a picket line, marched to protest the war in Vietnam, and I was much younger then, but I was brought along with her and my father. They were social activists. They were part of the movement and that was something that she wanted to instill in me, which is, ‘You have a voice. You can make a difference. You’re one person but you’re one person whose voice should be heard.’” — Nina Tassler on her mother’s influence on her as social activist. “I’m the product of shall I say a mixed marriage. My mother is of Puerto Rican descent converted to judaism so I was raised as a Puerto Rican Jew. And I think I somewhat felt marginalized or slightly disenfranchised growing up, so I always knew there would be hurdles and obstacles. I was educated in the theater which I felt was a community and environment where everybody had an equal say so I really thought that was like the world was like.” — Nina Tassler on whether or not she knew there’d be trouble in her life for being a woman. “I sure hope so.” — Nina Tassler on if she thinks we’ll have a female president. “I like to say I stepped away. I am one of the lucky ones, Larry. I was really blessed. I had an extraordinary run of things and I was looking to do something different… I had this burning desire to do something else…I had this book that I had been working on for almost four years. Weekends, evenings, and as momentum was building and as more and more contributors fell into place, I felt that I was onto something. I also was so grateful to have worked at the network for 18 years and in that time really had a chance to sot of reframe many of the different day parts, from prime time to late night to daytime to our summer programming.” — Nina Tassler on why she left her position at CBS. “I would say it’s one of the most exciting times in our meaty business…There are million places to pitch…As Leslie always says, ‘Content is everything.’ And the beauty of it is that there are so many different platforms. There are so many different voices out there. And what I’ll tell you also, it gives so many new writers coming into the business a chance to tell their stories.” — Nina Tassler on the new digital age of television. “She’s has been working at CBS for years. She’s an incredibly talented, deserving executive, so I’m so happy she got that job…There’s a saying that one woman at the table is a token, three women at the table is change and I think we still have a ways to go. But I’m thrilled for Channing and she’s well deserving.” — Nina Tassler on Channing Dungey, the first black woman to head a broadcast network and how it paves the way for the future of women. “Obviously there are the ratings, but when you become part of the social conversation, I think that’s really right now a hallmark of success. When you find pop culture referencing you, talking about you, when your friends are, when you’re engaged in social media, so it’s now not just the ratings. It is a part of pop culture and social media.” — Nina Tassler on if there’s a theme that runs through successful shows. “There is no limit to what a man or woman cannot do if he or she doesn’t mind who gets the credit.” — Nina Tassler on the best piece of advice she’s ever received. “Is that we’re all suits.” — Nina Tassler on the biggest misconception about entertainment executives. “I think one of the things that I say to most women starting their careers in show business is never be afraid to voice your opinion- good bad, or otherwise.” — Nina Tassler’s advice for women as they begin their careers. “I didn’t know how how big our bet would pay off. There’s something that happens when you’re watching a performer, when you just feel in your bones that this person is a force and there’s so much more there. And that’s what you saw on stage for James and once I met with him and heard pitches from him, looked at the rest of his material, and he worked obviously in comedy in the UK. And I think it was also when I met his producing partner. An incredibly talented young guy named Ben Winston and you knew that the dynamic between the two of them, there was great support, great respect. You knew they were going to be special.” — Nina Tassler on if she knew how big their bet on James Corden would pay off.